The ICCWC Strategic Programme 2016-2020 is ICCWC’s comprehensive strategy outlining the types of activities to be pursued by the Consortium up to 2020 based on funding availability and donor support. The Strategic Programme comprises of a set of concrete priorities and activities to substantially reduce poaching and trafficking in wildlife and forest products. It is guided by the strategic plans and work programmes of the five organizations and builds on the Consortium’s Strategic Mission 2014-2016, which identified key areas where ICCWC is uniquely-placed to make a contribution to effectively combat Illicit trafficking in wildlife. 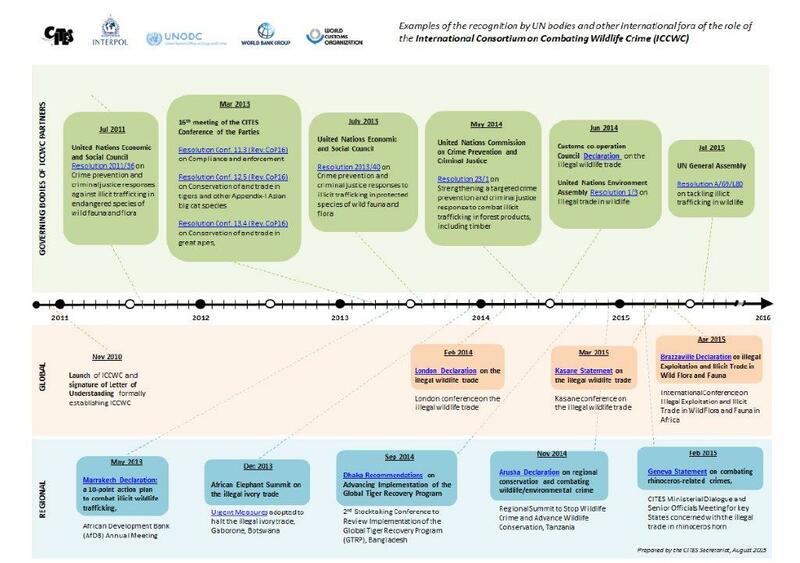 It includes 21 activities and 57 related sub-activities that have been identified and grouped based on a detailed analysis of activities conducted to date, and a review of priorities, recommendations and requests by the ICCWC Senior Experts Group and partner agencies, including findings and recommendations resulting from the implementation of the ICCWC Toolkit. It has been developed taking into account the shifting global landscape and activities underway by different organizations to combat Illicit trafficking in wildlife. It is based on a review of activities, priorities and recommendations following a detailed analysis of activities conducted to date. The emphasis of ICCWC’s approach is on building long-term capacity among national agencies responsible for wildlife law enforcement, and to provide these authorities with the tools and services that they need to combat wildlife crime effectively. Since its creation the important role of ICCWC has been widely recognized. The Consortium uses a light administrative model, with ICCWC partners leading on key initiatives. The ICCWC Strategic Mission 2014-2016 details the focus areas and strategies of the consortium, and provides a guiding framework for ICCWC activities. 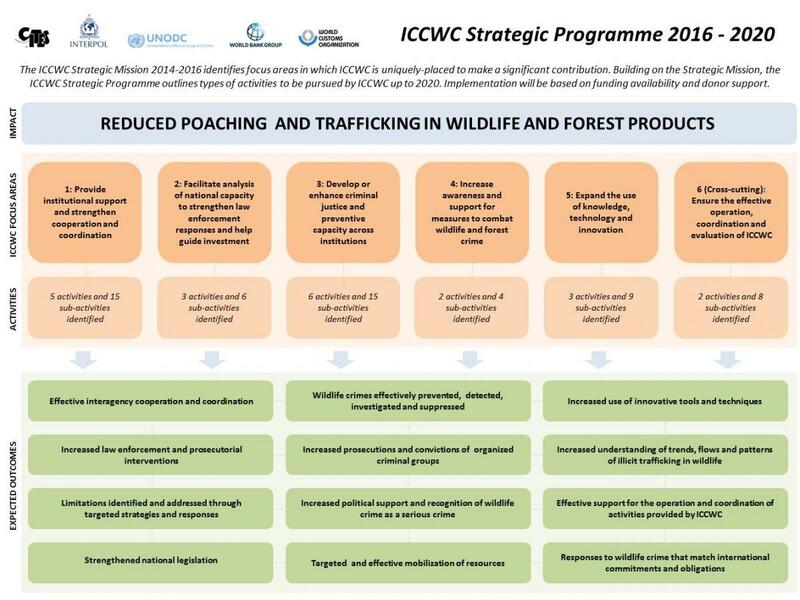 Building on its Strategic Mission, ICCWC has developed its Strategic Programme for 2016-2020, the Consortium’s targeted strategy to combat the illegal trafficking in wildlife in a comprehensive and coordinated manner for coming years. Each of the international organizations involved in ICCWC offers specialized expertise that can support national enforcement agencies and sub-regional and regional enforcement networks. Several of the organizations have already developed close working relationships on a bilateral or trilateral basis. However, before the concept of ICCWC, the five organizations had not worked in unison. All organizations have extensive experience of providing technical assistance, and some have country or regional offices and bureaus that already work on-the-ground alongside national law enforcement agencies. Each, in its own way, has engaged in extensive research into crime and effective ways of combating crime. They have an overview of crime and smuggling that is simply not available elsewhere. The organizations forming ICCWC have extensive experience in developing and delivering comprehensive training and capacity-building packages for law enforcement officers, at sub-regional and regional levels. Several have communication channels that allow real-time dissemination of intelligence to help national enforcement bodies in their risk-assessment, targeting and profiling activities and to facilitate investigations in different countries. They have experience in coordinating multi-national operations targeting illegal trade and smuggling. address the drivers of wildlife crime to reduce demand.